Alien themed tech-death masters, RINGS OF SATURN, announced their 24-date U.S headlining trek entitled The Dank Meme Tour. Kicking off on March 2nd at Club Redd, the tour will make stops in Anaheim, New York, and Atlanta before it concludes on March 30th at the Gas Monkey Bar 'N Grill in Dallas. Joining the band on stage are purveyors of Goblin Metal NEKROGOBLIKON, Colorado tech-metallers ALLEGAEON and California quartet ENTHEOS. RINGS OF SATURN comments, "We can't wait to head out on The Dank Meme Tour so we can bring more of the Ultu Ulla album to our fans live. With support from NEKROGOBLIKON, ALLEGAEON and ENTHEOS this tour is gonna be sick." "Hi, friends! 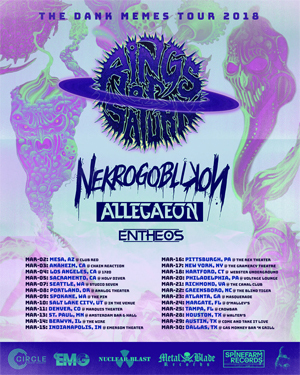 Very excited to announce that we are joining our friends in RINGS OF SATURN, NEKROGOBLIKON, and ENTHEOS, for another US tour in March. We can't wait to see all your faces, send us memes to harass each other with until we finish touring and hit the studio later this year for album number 5! If you're at a show, you’ll hear a new song: "Extremophile(b): Evolution"." RINGS OF SATURN released their fourth full length studio album, Ultu Ulla, last July. The alien death core quartet presented an entirely new and esoteric proposition to heavy metal that led to their highest first week sales. Tickets for The Dank Meme Tour are now available for purchase!